When you call this a strategy ~ it was certainly bizarre !! 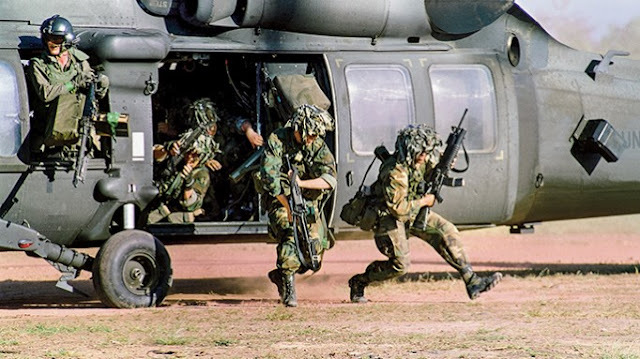 The American government brought his brutal six-year regime to an end in December 1989, with the invasion of Panama (code-named Operation Just Cause) but capturing the man himself proved more difficult. It involved one of the strangest operations in military history. Revealing an unexpected secret weapon – a sense of humour – the military set aside their guns for Guns N' Roses. The assault began on December 20. The Americans dropped more than 400 bombs in 13 hours, while the ruler fled across Panama City in a Hyundai, dashing from one hopeless hide-out to another, ducking into a school, a hospital and even a Dairy Queen fast food restaurant. "It was like a nightmare – like falling into a swimming pool and when you try to reach for the safety of a wall or touch bottom, you suddenly realise that walls and bottom had fallen away," he wrote in his memoir America's Prisoner. "All I could see was an endless, limitless ocean and thousands of weapons and men hoping to find me in their sights." He eventually found a place of refuge in the closest thing the Vatican has to an embassy, the Apostolic Nunciature of the Holy See. For days, he camped out in a sparsely furnished room, reading the bible and considering his options. The Americans were stumped. They certainly couldn’t draw him out by force – an assault on the Pope’s territory was hardly an option. The government wrote to the Vatican, begging them to refuse asylum, and describing the drug-lord as common criminal rather than a political refugee. But the request was scuppered by poor timing: it was Christmas, and the Holy See was swamped with other seasonal requests. Help came in the unlikely form of glam rock. For Operation Nifty Package – the extraction of the tyrant ruler as they designated him – special operatives set up enormous speakers around the building, blasting out the local US military radio station, SCN. To begin with, the station mostly played news bulletins, interspersed with some music. "We told the audience not to use the phone unless it was an emergency or official business," an official report later explained, "so we would not tie up phone lines." On the request line, requests became quite imaginative... played a lot of songs with the word 'jungle' in it”. Welcome to the Jungle, by hard rockers Guns 'n Roses, was a particular favourite. The man, an opera-lover, was stuck listening to Oingo-Boingo. He found his eardrums under attack from heavy metal acts like Black Sabbath, Iron Maiden and KISS, alongside cringeworthy pop-mongers such as Rick Astley and New Kids on the Block. They only interrupted this onslaught of rock and pop for one day: December 25, when the station instead played back-to-back Christmas hits. It was “a peculiar attempt to unnerve the refugee through questionable art,” “Blasting rock music was silly, childish, reproachable… but in some strange, postmodern way, it worked.”After 10 days, with his ears ringing and a mob gathering outside the gates, the Holy See's representative, Monsignor Jose Sebastian Laboa, told his guest he had to leave. The man agreed. He wrote two letters, one to his wife ("I go now on an adventure", he told her) and one to the Pope, thanking him for his hospitality. In full military uniform, he walked through the Nunciature's front gates – and was immediately tackled to the ground by a posse of US soldiers. Manuel Antonio Noriega, the brash former dictator of Panama and sometime ally of the United States whose ties to drug trafficking led to his ouster in 1989 in what was then the largest American military action since the Vietnam War, has died. He was 83. President Juan Carlos Varela of Panama announced Mr. Noriega’s death on Twitter early Tuesday morning. The atmosphere outside Gen Manuel Noriega’s battered, bullet-scarred comandancia, headquarters of the Panamanian Defence Forces, one early morning in October 1989, bordered on frenetic. Beyond the railings a woman sobbed with grief. Her husband, an officer involved in the previous night’s failed coup attempt against Noriega, was missing. It later transpired he and dozens of co-conspirators had been shot out of hand. The headquarters was guarded by heavily armed, paramilitary thugs from Noriega’s feared Dignity Battalions. A crowd of supporters cheered and shouted insults about the US president, George HW Bush. Then, without warning, Noriega, Panama’s feared dictator, spy chief and self-styled “maximum leader”, appeared on the steps wearing combat fatigues, a red baseball cap and a broad smile. Noriega, who died on Monday at the age of 83, was right to be nervous. The October coup attempt marked a turning point in Washington’s attitude to a man whose rise to power it had assisted, who became a valued CIA cold war asset and go-between in Central America’s dirty wars, but who turned into a monster US spy bosses could no longer control. Noriega had outlived his usefulness. Now he was an embarrassment. So Bush made him America’s most wanted. When Noriega subsequently launched a vicious wave of repression, threatened American personnel guarding the Panama Canal and declared a “state of war” with the US, Bush pounced. Economic sanctions and quiet diplomacy had failed. Control over the strategically and economically vital canal was threatened. And Noriega knew too much. In December 1989, Bush ordered Gen Colin Powell, then chairman of the joint chiefs of staff, to launch Operation Just Cause, sending 26,000 invasion troops into Panama in a rehearsal of the Powell “doctrine of overwhelming force” that was next employed two years later in the first Gulf war. Mr. Noriega died around 11 p.m. Monday at Santo Tomás Hospital in Panama City, a hospital employee confirmed. An official cause of death was not immediately available. Mr. Noriega had been in intensive care since March 7 after complications developed from surgery to remove what his lawyer described as a benign brain tumor. His daughters told reporters at the hospital in March that he had had a brain hemorrhage after the procedure. He had been granted house arrest in January to prepare for the operation. His medical problems came on the heels of a legal odyssey that had begun with the invasion and led to prison terms in the United States, France and finally Panama. While imprisoned abroad he suffered strokes, hypertension and other ailments, his lawyers said. After returning to Panama on Dec. 11, 2011, he began serving long sentences for murder, embezzlement and corruption in connection with his rule during the 1980s. It was an inglorious homecoming for a man who had been known for brandishing a machete while making defiant nationalist speeches and living a lavish, libertine life off drug-trade riches, complete with luxurious mansions, cocaine-fueled parties and voluminous collections of antique guns. It was a quirky life as well: He liked to display his teddy bears dressed as paratroopers. Mr. Noriega, who became the de facto leader of the country by promoting himself to full general of the armed forces in 1983, had a decades-long, head-spinning relationship with the United States, shifting from cooperative ally and informant for American drug and intelligence agencies to shady adversary, selling secrets to political enemies of the United States in the Western Hemisphere and tipping off drug cartels. Whose side he was on was often hard to tell. It was an awkward embrace that befitted the history of American and Panamanian relations since the United States built the Panama Canal early in the 20th century. The United States continued to operate the canal — and govern a strip of territory alongside it — for eight decades before turning it over to Panama on Dec. 31, 1999. Just like many other stories, a man nurtured by some, grew and turned his guns against the same, only to be pummelled and dishonoured. Sad, that’s history ! PS : Being a foreign story collated from many sources including NYtimes, Guardian, the Sun, BBC and more.